Voice Control: The unique Voice control has six different channels - Clean Warm, Clean Bright, Crunch, Super Crunch, OD 1, OD 2. When used together with Blackstar's patented ISF control you can get the exact tone you're thinking of. 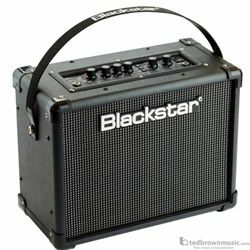 Super Wide Stereo: Blackstar's unique Super Wide Stereo technology gives you an immersive sound experience that will have you be playing along to your MP3 backing tracks for hours. 12 Effects: 12 vintage style studio quality effects - 3x modulation, 3x delay and 3x reverb effects, specially voiced for electric guitar and delivered in massive SUPER WIDE STEREO. EQ via ISF: The patented ISF control gives you access to infinite new sound possibilities from the USA to the UK and everywhere in-between. This fully interactive control allows you to infinitely adjust the response of the tone control network between any of the traditional voicings. In this way you can design your own sound and truly find the sound in your head. MP3/Line Input: Stereo MP3/Line In - for great sounding jamming or listening to music in SUPER WIDE STEREO. USB Connectivity: USB audio for pro recording capability - easily get great tone recorded. Speaker Emulated Line Out: Speaker Emulated Line Out - for silent practice or recording. Insider GUI: INSIDER software gives you more - deep editing of your amp, exchanging sounds with the Blackstar Online Community and downloading artist patches: all for free. Share Patches: Download and share patches. Store your CORE ID sounds - 6 internally or more via free INSIDER software. Download or share patches online using the INSIDER community pages.